…Lord Kṛṣṇa picked up Govardhana Hill with one hand, exactly as a child picks up a mushroom from the ground. Thus He exhibited His transcendental pastime of lifting Govardhana Hill. 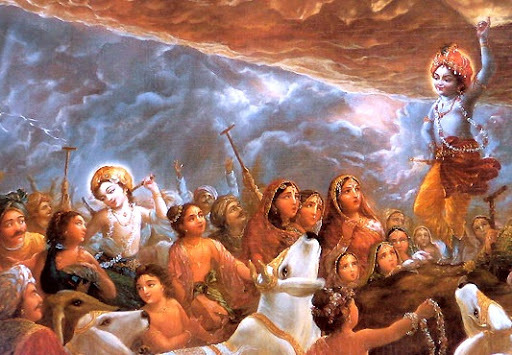 Lord Kṛṣṇa then began to address His devotees, “My dear brothers, My dear father, My dear inhabitants of Vṛndāvana, you can now safely enter under the umbrella of Govardhana Hill, which I have just lifted. Do not be afraid of the hill and think that it will fall from My hand. You have been too much afflicted from the heavy rain and strong wind; therefore I have lifted this hill, which will protect you exactly like a huge umbrella. I think this is a proper arrangement to relieve you from your immediate distress. Be happy along with your animals underneath this great umbrella.” Being assured by Lord Kṛṣṇa, all the inhabitants of Vṛndāvana entered beneath the great hill and appeared to be safe along with their property and animals. …The inhabitants of Vṛndāvana and their animals remained there for one week without being disturbed by hunger, thirst or any other discomforts. They were simply astonished to see how Kṛṣṇa was holding up the mountain with the little finger of His left hand. Kṛṣṇa has declared in the Bhagavad-gītā that the worshipers of the demigods are not very intelligent. He has also declared that one has to give up all kinds of worship and simply concentrate on Kṛṣṇa consciousness. Kṛṣṇa’s invoking the anger of Indra and later on chastising him is a clear indication to His devotee that those who are engaged in Kṛṣṇa consciousness have no need to worship any demigod, even if it is found that the demigod has become angry. Kṛṣṇa gives His devotees all protection, and they should completely depend on His mercy. Thinking in this way, Lord Kṛṣṇa immediately picked up Govardhana Hill with one hand, exactly as a child picks up a mushroom from the ground. 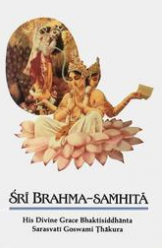 Thus He exhibited His transcendental pastime of lifting Govardhana Hill. Lord Kṛṣṇa then began to address His devotees, “My dear brothers, My dear father, My dear inhabitants of Vṛndāvana, you can now safely enter under the umbrella of Govardhana Hill, which I have just lifted. Do not be afraid of the hill and think that it will fall from My hand. You have been too much afflicted from the heavy rain and strong wind; therefore I have lifted this hill, which will protect you exactly like a huge umbrella. I think this is a proper arrangement to relieve you from your immediate distress. Be happy along with your animals underneath this great umbrella.” Being assured by Lord Kṛṣṇa, all the inhabitants of Vṛndāvana entered beneath the great hill and appeared to be safe along with their property and animals. All the men loaded their valuables on carts and slowly left with their cows and other paraphernalia. After they had cleared out everything, Lord Kṛṣṇa very slowly replaced Govardhana Hill exactly in the same position as it had been before. When everything was done, all the inhabitants of Vṛndāvana approached Kṛṣṇa and embraced Him with great ecstasy. The gopīs, being naturally very affectionate to Kṛṣṇa, began to offer Him curd mixed with their tears, and they poured incessant blessings upon Him. Mother Yaśodā, mother Rohiṇī, Nanda, and Balarāma, who is the strongest of the strong, embraced Kṛṣṇa one after another and, from spontaneous feelings of affection, blessed Him over and over again. In the heavens, different demigods from different planetary systems, such as Siddhaloka, Gandharvaloka and Cāraṇaloka, also began to show their complete satisfaction. They poured showers of flowers on the surface of the earth and sounded different conchshells. There was beating of drums, and being inspired by godly feelings, residents of Gandharvaloka began to play on their tambouras to please the Lord. After this incident, the Supreme Personality of Godhead, surrounded by His dear friends and animals, returned to His home. As usual, the gopīs began to chant the glorious pastimes of Lord Kṛṣṇa with great feeling, for they were chanting from the heart.